Start by creating a new container. Browse your object tree to containers and select it, right-click in the listings window and select New. Now give your new container a unique ID, for this version of the scripts give the container a name (I use the name of the priest i get them from) and add the nif for that mask-bust. Now in the Scripts section to the right add the V2 script for the mask this bust will use, V2_Miraak for the Miraak mask in the Dragonborn DLC only or Standard for all other masks. 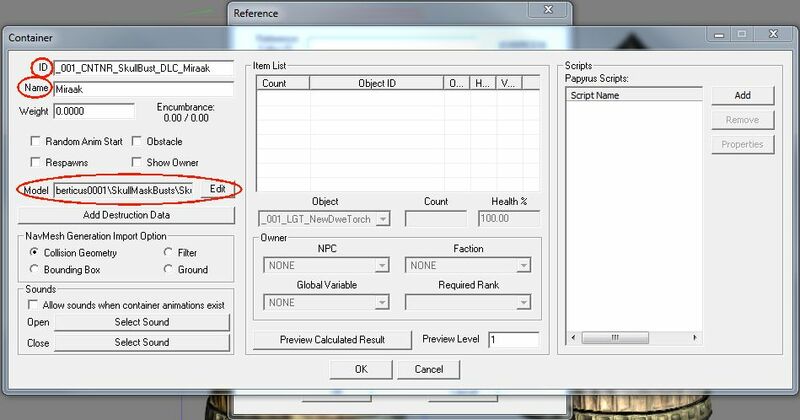 Once added hit Properties and in the Miraak only script just hit Auto-Fill All. Or for the Standard version hit Auto-Fill All to fill the default message then select myMask, hit Edit Value and scroll down till you find the right mask. Now it's just a case of deciding which bust to use! Once you've made your decision and set all the settings just drag each into the render window as normal and move into position. NOTE: The 2 new sets will be floating as I had to cater to the location of the animations so just lower into position.